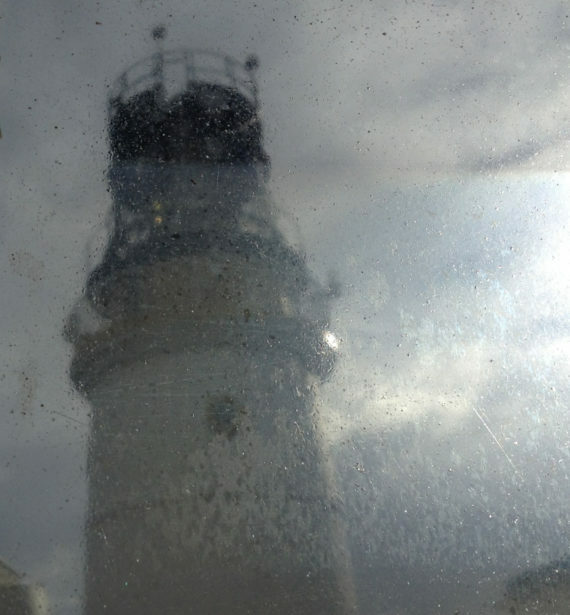 A month as Artist in Residence at Sumburgh Head Lighthouse & Visitor Centre - and afterwards...? 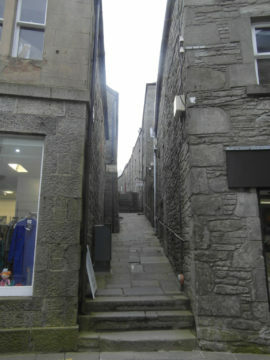 Some final photographs of Lerwick: “slightly old-fashioned” is meant to be a compliment. 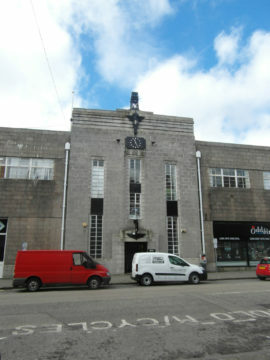 Aberdeen is not certainly not old-fashioned; dour perhaps, but up-to-date. It has a massive harbour sealed off with high fences, so that you couldn’t fall into the water even if you wanted to. 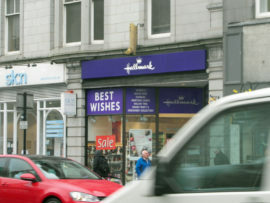 It has several shopping malls with overheated chain stores, where you can buy imported stuff identical to the stuff available everywhere else in the U.K. (except in Lerwick – probably). It has sushi bars and Costa Coffee. It has Big Issue sellers. It has hipsters. But oh, the faded glories of Union Street, once the Knightsbridge of the North. Ah, Esslemont and Mackintosh, and the exclusive tailors and kiltmakers; and the gilded wooden signs hanging above the shops and banks. All gone. Actually, the kiltmakers have moved sideways onto the adjoining streets, but still…..
Wandering down Union Street, keeping your gaze at eye level, you could be anywhere in the UK. But you only have to pause and look properly to see something unexpected: an granite Art Deco building on a side street, Empire Gothic turrets on an ex-bank. Unexplained details on the faux-Arabian theatre by the docks (armchairs??? surely not). The granite setts are yellow or pink as well as grey. Some buildings are bright pink in the sun. Everything changes, and not necessarily for the worse. Memories are not always reliable, particularly with regard to somewhere known only from childhood holidays and family folklore. There were the Bon Accord Baths on Justice Mill Lane, where I learned to swim – now closed. 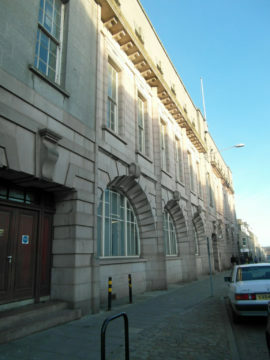 The Art Gallery, where hung my favourite picture – closed for refurbishment. 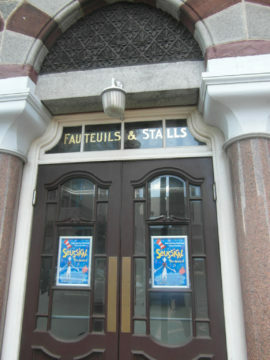 The Music Hall (never went there, but it’s a fine building) – closed for refurbishment. Marischal College and Tower, where there was a museum with real shrunken heads – now the seat of the City Council (no irony intended) and closed to the public, as far as I could tell. 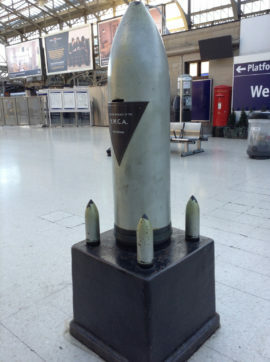 But some remembered things are still there: the artillery shell collection box at the station, for one. 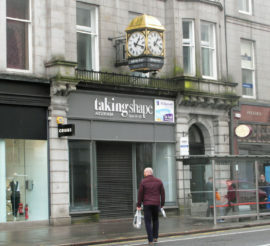 There is even a surviving gilded boot on Union Street; and a jewellers’ gilded clock. … a last look around Lerwick. Travelling by ferry is very civilised. For the 7p.m. sailing, foot passengers check in at any time from 5. 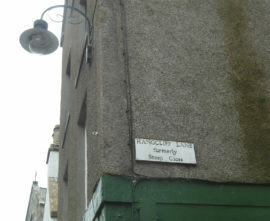 Just right for a last cup of coffee and a wander up and down Commercial Street – the hub of Lerwick. The ferry terminal is a short stroll from the centre of town, and you can leave your luggage there while you pay a last visit to the museum café. I think it fair to say that some aspects of Lerwick are a little old-fashioned: for example, it still has several banks and two Post Offices. There is a shoe shop. It is undoubtedly picturesque. The town seems to have maintained the internationalism of a port without overt multi-nationalism. And here’s another old-fashioned thing: it still is a working port, and the port and the town are inseparable. Wherever you walk in the old town, you are within sight or sound of the harbour; men in deep sea waterproofs and yellow wellingtons are walking down the street; there are no high walls separating road and footpath from the docks, and there are houses right down to the water’s edge. 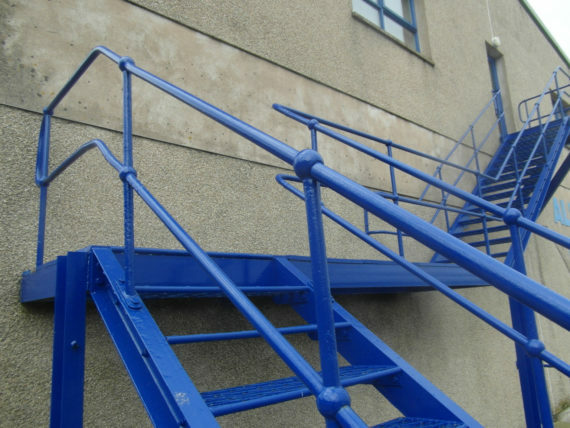 Mostly it is well tended, and I found the nearest thing to Yves Klein Blue I have seen outside a gallery. A proper day off, or two. Leaving my car behind in Wales was undoubtedly a wise move. I have thoroughly explored a relatively small area on foot, and have seen far more than you ever do when rushing around in a metal box on wheels. 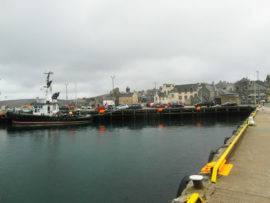 I have even managed some days off in Lerwick, the main town, population 7,500. (Compared with Abergele & Pensarn, pop. 10,00, or Llandudno + Penrhyn Bay, pop. 20,00. Thank you Wikipedia.) 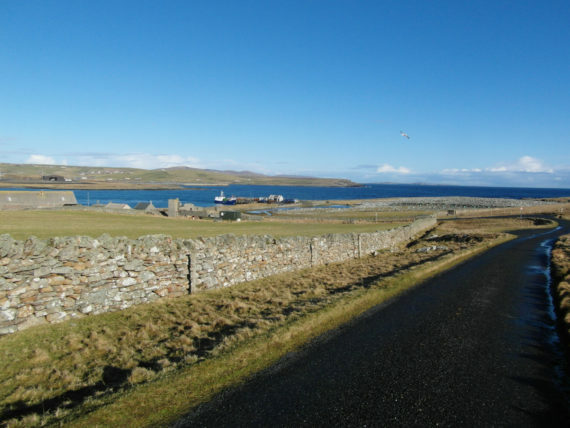 Lerwick is an hour’s bus ride away, and the journey involves a lot of zig-zagging through little settlements on either side of the main road. The place names sound very Viking – Exnaboe, Fladdabister, Aithsetter. The view from the bus window is superb, looking precipitously down into rocky bays. The bus drivers are generally cheerful, and full of useful information. And the buses run to time. I have become accustomed to the mile-and-a-bit walk to the bus stop at Sumburgh, and even look forward to the way back, taking the cliff top path as a treat. Or going the long way round via Grutness Harbour. 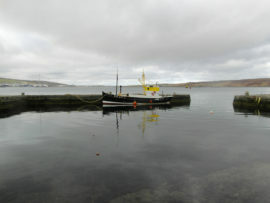 Lerwick has an excellent new museum and gallery, with a brilliant café – great coffee and a view over the harbour. It also has exhibitions: currently “A Shetland Series – Banks and Skerries” drawings, photographs and three dimensional objects by Gemma Graham, who was born in Shetland and has recently returned home. Her drawings are in black ink on paper, detailed in execution and hypnotic in effect. 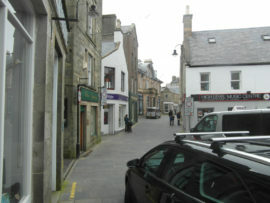 What Lerwick does not have is a major shopping centre. Or rather, it doesn’t have a mall full of chain stores. It has a perfectly serviceable shopping centre down on the docks, with local produce for sale. The high street has some very nice independent retailers, including a proper bookshop and a music shop, but sadly also has empty shops and some rather run down premises. But if you look, you can find almost anything you might want, all within a breath of the sea. I have been very good, and kept out of the chocolatier’s. But perhaps I might succumb tomorrow, when the idyll ends and I have to take the ferry back to the mainland. When I set out for Shetland a month ago, I was expecting it to be a) windy, b) dark and c) still winter. I was right about a), as mentioned in previous posts. I was wrong about b) and c). It wasn’t any darker than at home, and now the clocks have gone forward it is of course light until well after 8 o’clock. 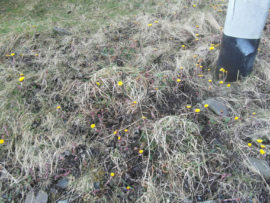 When I arrived here, there were a few daffodils in flower, but most were at the same stage as those in my own garden: small yellow buds pointing vertically upwards. 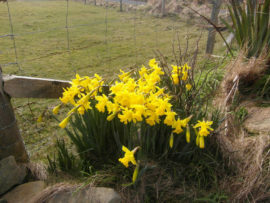 Now, however, there are definite signs of Spring, and daffodils appearing in every corner. A blackbird started singing at the lighthouse two days ago, the razorbills and kittiwakes are arriving and there are skylarks singing everywhere. 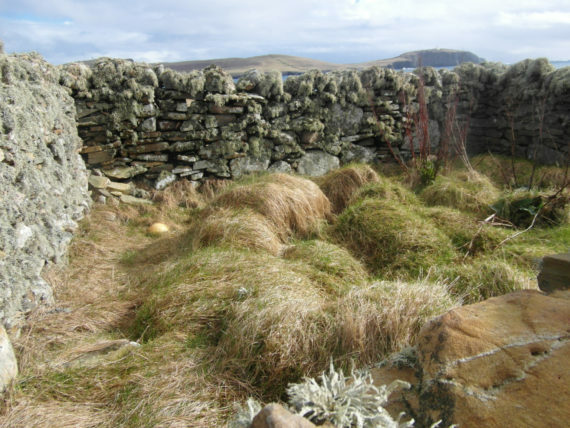 As far as I can tell, gardening is not a very popular leisure activity in Shetland. The islands are really too windswept for anything but the hardiest (and shortest) plants to survive. The predominant terrain is treeless moorland. New houses – and there are an awful lot of them – have a sort of “plonked down on the plot” look, surrounded by grass or even chippings. Presumably it takes a very long time for plants to get established at 60 degrees North. There are a few polytunnels: not your effete flappy polythene type, but solid sheets of curved plastic, battened down solidly onto proper foundations. The older houses are surrounded by low stone walls, behind which lurk clumps of very hardy perennials, showing a little green but no flowers yet. 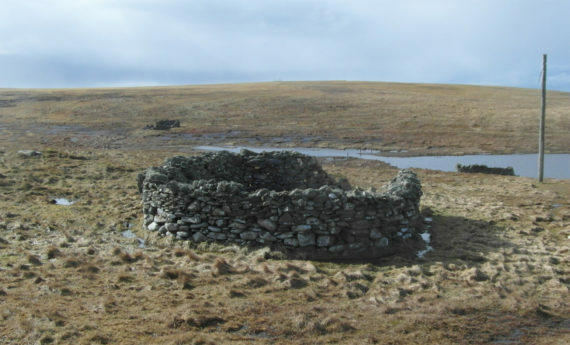 The old crofters had the delightfully named plantigrubs – stone walled enclosures for growing crops which would not survive out on the hillsides. Even today, the soil inside is rich and black and at least a foot higher than the surrounding land. The hillsides are still brownish: pale Naples yellow, or buff titanium, where last year’s dead grass still stands; dark reddish brown (caput mortuum?) where the heather grows. It must be spectacular when it’s in flower, but now it is completely dormant. However, the fields around Sumburgh farm are definitely greening up, as is the grass by the airport runways. 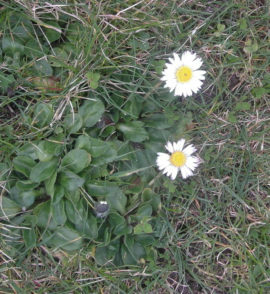 Here and there, the wild flowers are coming out, and when I walk along the cliff path I can see tiny shoots of green grass pushing through the dead stems. A bumblebee buzzed out of the daffodils immediately after I pressed the shutter of the camera. Drawing, painting, printmaking, wandering, wondering.